Gail Davis Connor has a birthday today. 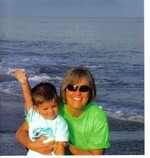 My Grandson, Davis, and I at the beach. What Fun!! !